1865 New Hartford Nov. Sat 25 J Maxwell worked from 8 o 9 o clock till noon chopping logs & Pa. drew the logs to mill. "[1/2 inch?]" At I. O. of Good Templars on corn. of 3 to sell Lodge Stone. Sun. 26 Went to Church Eld. Faucett preached C. Collins here after meeting Called on Henry Sargent Sick At S School concert in evening "[Borrowed?]" a book "[illegible]" Mon. 27 C. Harmon here all night Livingston "[&?]" Maxwell & Fred. worked on house. 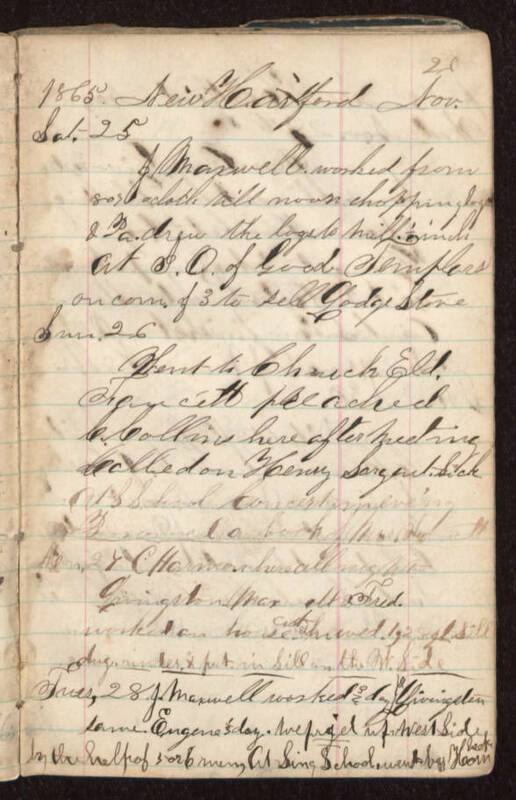 Cut & hewed 1,28 ft Sill "[illegible]" & put in Sill on the W. Side Tues, 28 J. Maxwell worked 3/4 day & Livingston same. Eugene 1/3 day. We pryed up West Side by the help of 5 or 6 men, At Sing School. went by Horn "[beck?]"